Published by: Tile Logic ? IRC Explorer v2.2.1.0 - Release #25 Core feature changes: • Fixed a critical issue which caused IRC Explorer to break multibyte encodings. 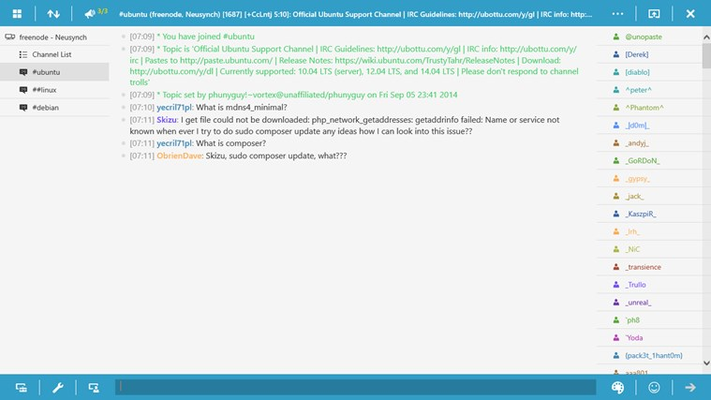 • Fixed an issue which caused the commands popup to display when trying to copy clickable/tappable nicknames.  • Revamped logging engine now supports real-time logging.  • Added a configuration entry point for the timestamp format of logged messages. 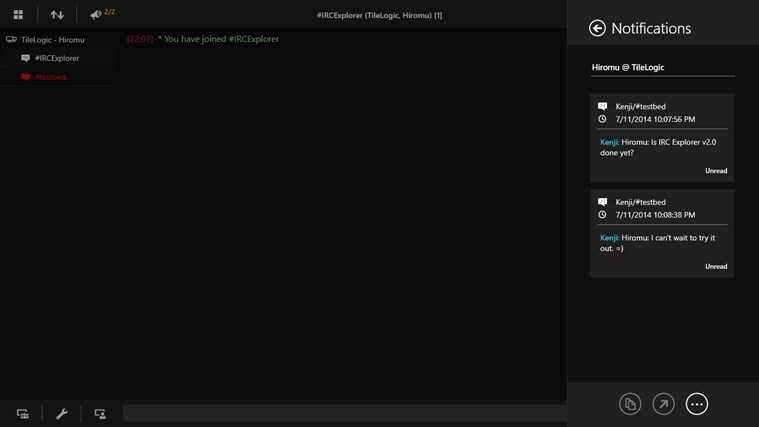 • Added support for replaying local logs in channels, private queries, and DCC chats. (UserVoice request)	• Minor UI tweaks and bug fixes. 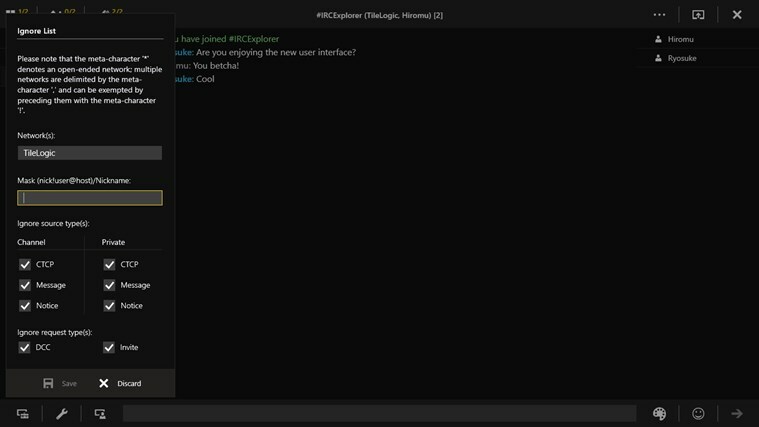 IRC Explorer is a modern Internet Relay Chat (IRC) client designed exclusively for the Windows 8 operating system. 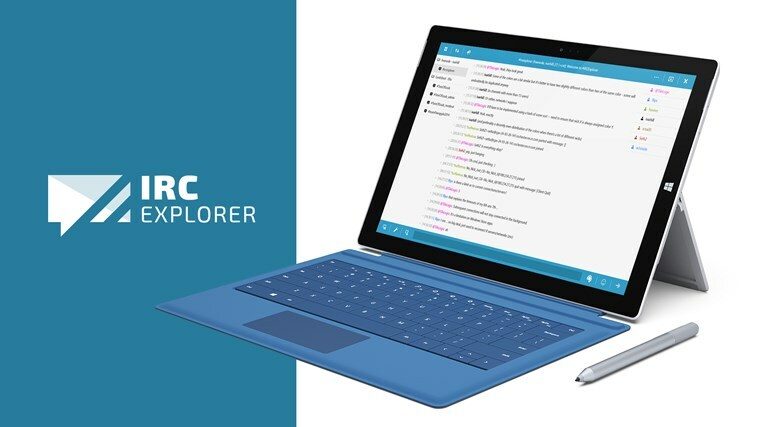 IRC Explorer delivers rich IRC content through its intuitive user interface and allows you to communicate with people from around the world. 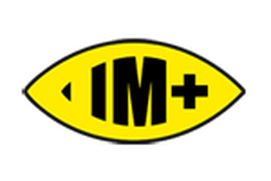 You can join multiple IRC networks, chat rooms, and even participate in private one-on-one conversations. Let's get started and explore IRC on Microsoft's latest operating system! Need assistance? 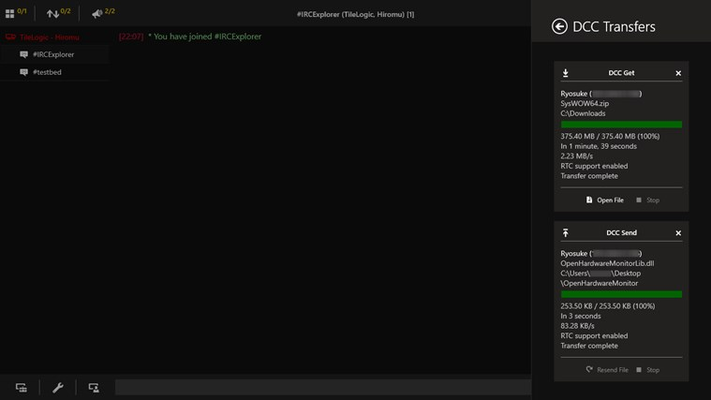 Visit our support channel #IRCExplorer @ irc.freenode.net. 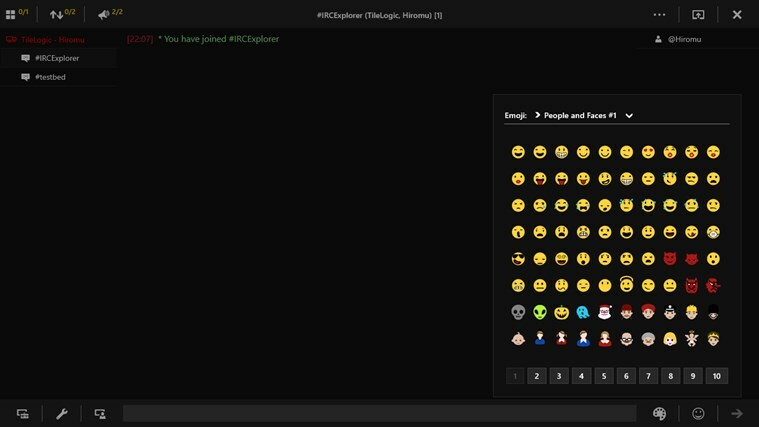 Like us on Facebook (https://www.facebook.com/IRCExplorer) to get the latest updates! Still hasn't fixed a bug which causes it to crash, despite contacting months ago... And haven't seen him say a word for months in his channel. Does everything I want, and then some. Great IRC client. 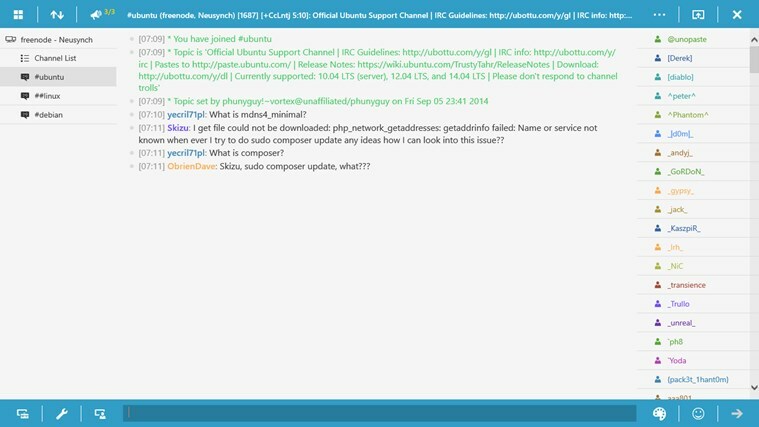 Hooks up to ZNC just fine. 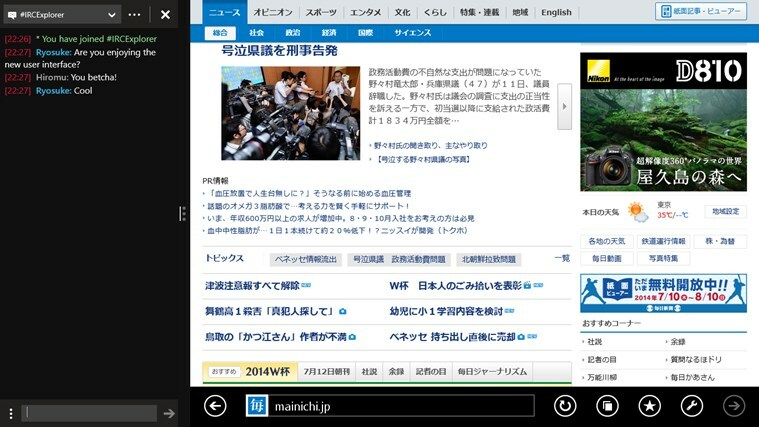 When docked, I can open up links in desktop Chrome. I like the built-in themes (maybe there could be more). The interface is very easy to use and uncluttered. I bought it after about 15 minutes with the free version. 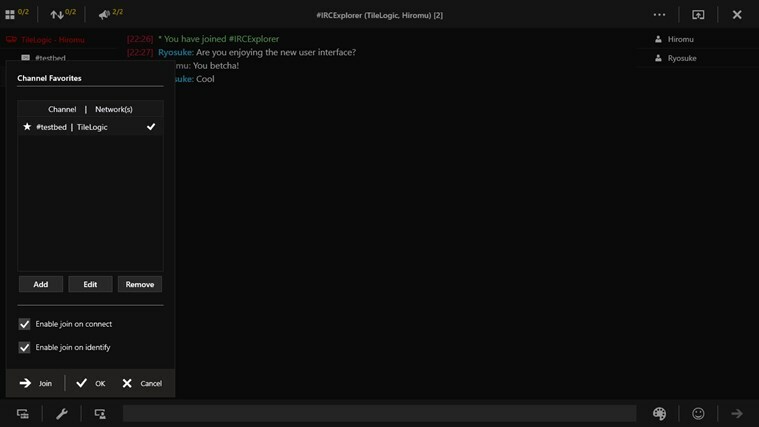 The best IRC client I've used on Win 8. IMO the best IRC app for Windows. Works fine with ZNC. 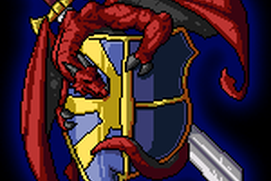 Only thing is, I can't find the options for ignoring joins/parts? I'll try to find it and update this review when I do. if I set the client to run in lockscreen/background, I lose the ability to connect to my ZNC servers. i'm sure this applies to regular IRC servers, too. I've been searching for a beautifully designed and functional IRC Client for the longest and I have to say, I've found it! Love the app. Keep up the good work and please don't stop developing! I love this app but I can't use it until it's updated. When you try to connect to a server it just never goes through on Windows 10. 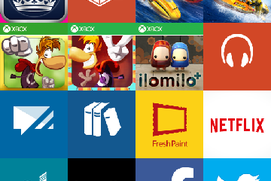 Works fine on windows 8.1 obviously. I've been on the look out for a good IRC client. This one is slick. Looks very nice and runs smooth. Has most of every feature you would need. Unfortunately for me to replace my mIRC client I would need a button someone to "Tile" all of my channels so they are all visible at one time. The current way of "multitasking" is very limited. Although it does workout fine if you are only in 3 channels. I'm generally in about 6 or more. Keep up the great work. Excellent IRC client. Only fail is when clicking links on a multiple monitor system, even with the default browser open on another monitor, irc minimizes. Please add an option if possible to open links in the background. Otherwise, the growth of this client is awesome. I use it over all desktop client options.